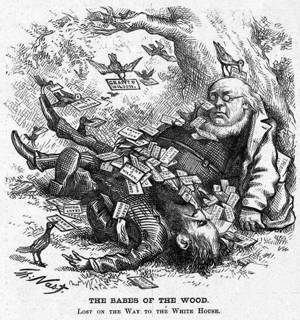 With “The Babes of the Wood: Lost on the Way to the White House,” on the back page of the August 10 Harper’s Weekly, Nast appears for the first time to assume that the end was within view for Greeley and his running mate, Gratz Brown. The cartoon is an adaptation of an English children’s story concerning two children who had been left to die in a forest so that a wicked uncle might secure their inheritance. In the original, they are covered with leaves by “friendly Robin Redbreasts” in a vain attempt to keep them warm. Here, the “blanket” is formed by voting ballots for Grant and his running mate, Henry Wilson.